Hi, hope you're having a good Thursday. This was my first week back to work for two days a week, it went okay, but it is early in the tax season here, so things will get more hectic soon. 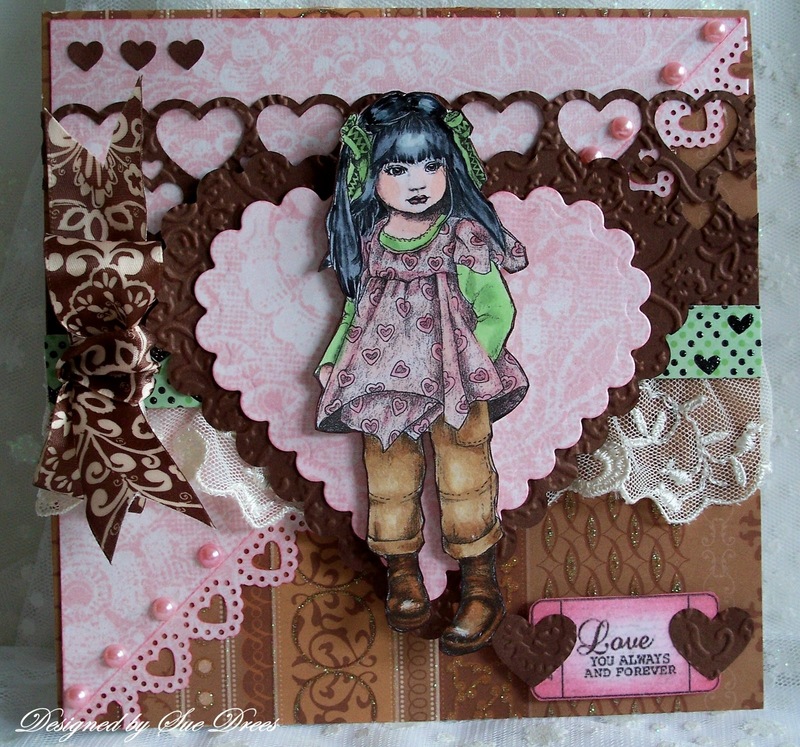 Today's card is another image from the digital collection called Adorables from Sugar Nellie. I am so in love with these little girls. They are so beautifully drawn and shadowed that they are a dream to color, and that's coming from a die-hard rubber stamper!!!!!!! 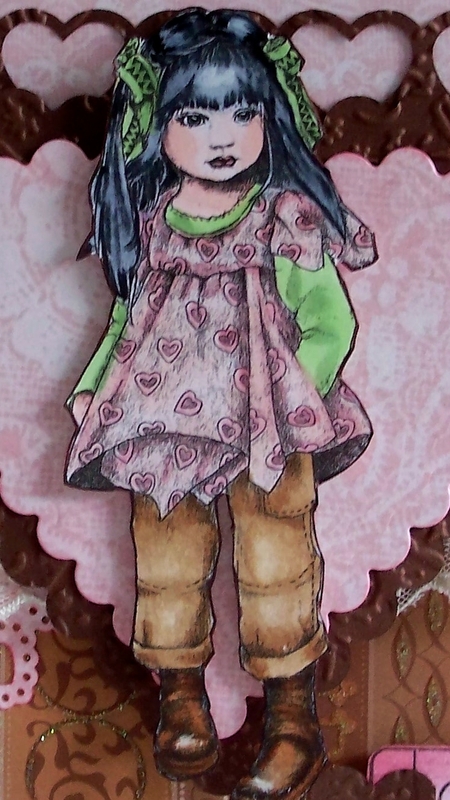 This is a ticket digi from Cutiepie Inspirations and it is an entire sheet and it was free! The card is made from the sketch at Midnight Madness #87. I haven't participated in the challenge for awhile and for no other reason than life gets in the way, but I have missed it. I particularly love this sketch, and it fit so well with these little girl digi's. Enjoy the rest of your Thursday. Thanks for stopping by. Tomorrow is the mid-way card for the Fuzzy Wuzzy Challenge, just a warning, put your colored glasses on kids before viewing!!! Beautiful card, love all the hearts. Beautiful coloring. Thanks for joining us at Do You Stack Up. Gorgeous card - those Adorables are really lovely - have just bought this one myself and can't wait to use it!! Thanks for joining us at DYSU this week. This is such a lovely card, and a great take on the MMSC! That image is fantastic, and I'm so glad you could play along with us this week! So pretty! Love the image. WOW this is absolutely GORGEOUS! The colours are amazing! Thanks for sharing with us at Speedy's Friends. Wow, this card is beautiful! And the colouring is amazing. GREAT! I am in awe of your talent, Sue! Love your coloring! Beautiful card! That is an awful lot of challenges for you, Mrs. Drees!!! What a beautiful card, these images are beyond precious and you've brought her to life with such stunning colouration, I love it!!! There's always something that breaks even the strongest willed of rubber stampers, lol!! Soo cute.. love this image. Way to "Stack Up" and bring out the PINK in your creation.. Thanks for playing with us at www.doyoustackup.blogspot.com can't wait to see what you create next week.. Very pretty! An adorable image and you colored her beautifully. I love all the different hearts and the pink pearls. Pink and brown is a wonderful combination I think. Thanks so much for playing along with us at DYSU. So pretty. I love the brown tones that you used, so soft and pretty. That image is great too, so vintage!! Thanks so much for joining us at Midnight Madness this week. 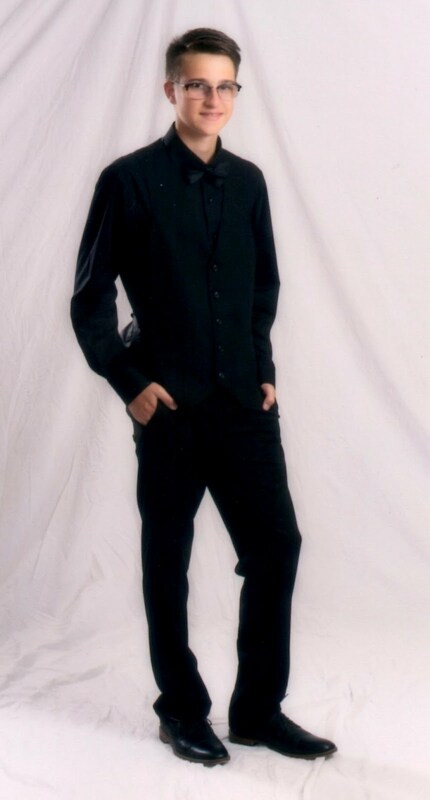 Wow this is so pretty and feminine Sue! 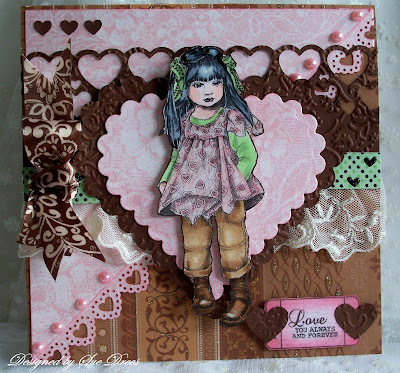 I love all your hearts and the chocolate and pink colour scheme :) Such a beautiful image too. So great to see you again! Absolutely LOVE your photo of the Niagra falls. I don't want to think about how cold there must have been... brrrr. We have had a couple of cold months here in Norway, but luckily nothing like that. Your card is very sweet. The girl is adorable and your colorings are amazing. Love the bow! Thanks for joining in our challenge. I hope to see you again soon! Okay- well u know what...I LOVE blog dog! ha ha! so cute! AND ...YOUR card is incredibly cute cute cute! Did I mention the blog banner is really cool here too??? :) tfs and glad u joined in at Copic Creations!